If we consider the religious variety embraced by the offspring of CF. Powys and Mary Cowper Johnson, the full range of modern western spiritual experience is represented. 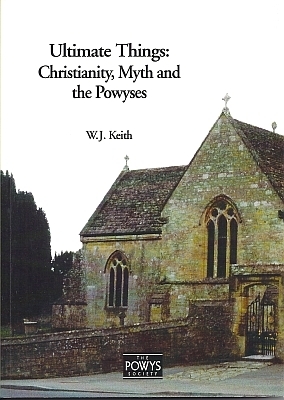 It extends from full acceptance of Roman Catholicism (Littleton Alfred Powys, JCP's son, who died a priest) to total rejection of Christian claims (Llewelyn). In between, there are numerous gradations: a considered preparedness to conform outwardly to tradition (Littleton, Bertie, Will, and Lucy), a reformulated faith in the Christian vision (Gerard Casey), as well as a stubborn, resistant independence detectible in various ways in Gertrude, Marian, and Katie - and, of course, the special cases of Theodore's one-of-a-kind enigmatic private world-view, and JCP's imaginative acceptance of all possibilities in a world recognized as fascinating, mysterious, and ultimately inscrutable. If in their basic solidarity they seem 'one monstrous Powys', as individuals they were indeed 'many'. The Reverend C.F. Powys (1843-1923) was successively a curate at Bradford Abbas in Dorset (1867-72), vicar of Shirley in Derbyshire (1872-9), a curate at Dorchester in Dorset (1879-85), and vicar of Montacute in Somerset (1885-1918). Between 1872 and 1890, he and his wife produced eleven children, of which, remarkably for that period, ten lived to maturity; moreover, four of them survived into or beyond their ninetieth year. It was an exceptionally gifted family. The three best known – John Cowper (1872-1963), Theodore (1875-1953), and Llewelyn (1884-1939) – had substantial literary careers, while four others each published at least one book. Most of them, indeed, distinguished themselves in some sort of artistic or intellectual endeavour. Littleton became an influential headmaster, Gertrude an artist of considerable ability studying and exhibiting in London and Paris, A.R. (Bertie) a well-known architect, while Marian was recognized as a leading authority on the creating and conservation of lace. Philippa (Katie to family and friends), though hardly a successful writer, published a slim volume of poetry and one novel in her lifetime, but more fiction, poems and considerable extracts from her diaries are now available. Interestingly, almost all of them moved away from the Anglican Church in which they had been born and brought up; at the same time, they remained acutely responsive to religious issues and explored alternative religious – or, at least, spiritual – beliefs. In view of the religious preoccupations that dominate the writings of John Cowper, Theodore and Llewelyn, it seems essential that we establish, as precisely as we can, not only the positions that individual members of the family embraced, but also, as far as possible, what they believed (and did not believe) at various stages of their careers. By the same token, we need to determine the extent to which they discussed religious matters with each other, and in some cases notably influenced each other. However, the Powyses themselves rarely made attempts to arrive at any systematic conclusions.